Patchwork can be used in conjunction with tests suites to build a CI system. Patches sent to the mailing list are grouped into series by Patchwork which, then, exposes events corresponding to the mailing-list activity. Listening to those events, one or more testing infrastructure(s) can retrieve the patches, test them and post test results back to Patchwork to display them in the web UI. Optionally, Patchwork can send those test results back to the user and/or mailing-list. Details about steps 1 and 2 can be found in Submitting patches. Step 3 is Patchwork exposing new series and new series revisions appearing on the mailing list through the series-new-revision event. This event is created when Patchwork has seen all patches that are part of a new series/revision, so the API user can safely start processing the new series as soon as they notice the new event, which, for now, is done polling the /events/ entry point. To poll for new events, the user can use the since GET parameter to ask for events since the last query. The time stamp to give to that since parameter is the event_time of the last event seen. Step 4 is, of course, where the testing happens. Once done, results are posted back to Patchwork in step 5 with the /test-results/ entry point. One note on the intention behind the pending state: if running the test(s) takes a long time, it’s a good idea to mark the test results as pending as soon as the series-new-revision event has been detected to indicate to the user their patches have been picked up for testing. Finally, step 6, the test results can be communicated back by mail to the submitter. By default, Patchwork will not send any email, that’s to allow test scripts authors to develop without the risk of sending confusing emails to people. Test result emails are sent to the patch submitter with the project mailing-list in Cc. Test result emails are sent to the list of email addresses specified in the Mail To: list field. The Mail To: list and Mail Cc list are list of addresses that will be appended to the To: and Cc: fields. To interact with Patchwork, the REST API can be used directly with any language and an HTTP library. For python, requests is a winning choice and I’d have a look at the git-pw source code. git-pw also provides a couple of commands that can help with writing test scripts without resorting to using the REST API. git pw poll-events will print events since the last invocation of this command. The output is one event per line, oldest event first. poll-events stores the time stamp of the last event seen in a file called .git-pw.$project.poll.timestamp. As shown, git pw poll-events prints JSON objects on stdout. Its intended usage is as input to a filter that would take each event one at a time and do something with it, test a new revision for instance. The other side of the patchwork interaction with testing is sending test results back. Here as well git-pw provides a command to simplify the process. Remember it’s always possible to directly use the REST API. A slightly longer example can be found in the Patchwork repository, in docs/examples/testing-checkpatch.py. This script will take series-new-revision events as input, as offered by git pw poll-events and run checkpatch.pl on the incoming series. 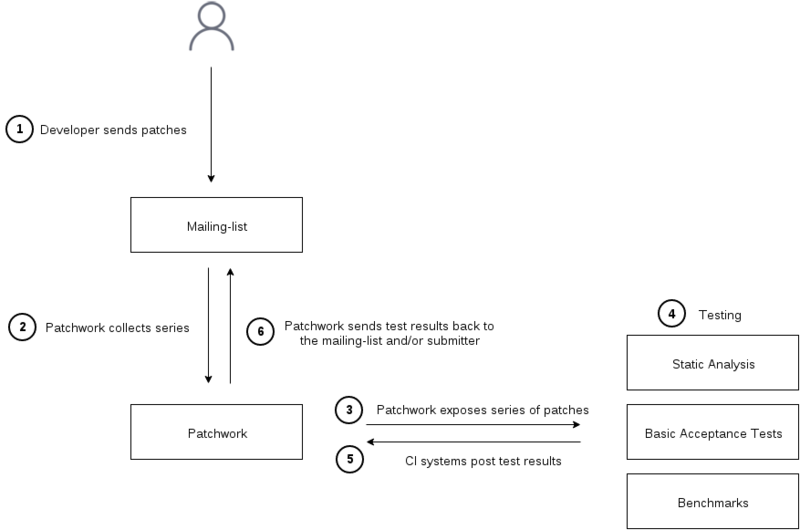 The main complexity beyond what has been explained in this document is that checkpatch.pl is run on each patch of the series individually (by looping on all mails of the series mbox) and the checkpatch.pl output is aggregated to be sent in the summary field of the test result. There are a few improvements to make to have a nicer solution: for instance, one could make sure that the checkpatch.pl script is up-to-date by updating the Linux checkout before running the test.